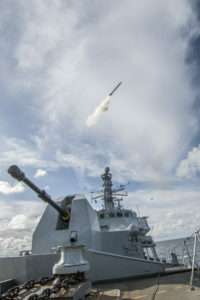 The announcement, made at the RUSI Sea Power Conference in London, follows detailed analysis of data gathered during the first of class firing trials by HMS Argyll, which took place last year. HMS Westminster and HMS Montrose, the second and third ships to be fitted with Sea Ceptor, have since also carried out successful firings. Sea Ceptor has been designed and manufactured by MBDA and is directly supporting 600 jobs in Bristol, Stevenage and Bolton as part of the Team Complex Weapons partnering agreement between MOD and MBDA. The first firings of Sea Ceptor were conducted from HMS Argyll at the Hebrides range off the coast of Scotland and saw the system tested against a range of complex scenarios – including engaging multiple targets at once. Sea Ceptor is a major improvement on the existing Seawolf missile system which is being replaced. It offers improved performance against current and projected future threats, the ability to engage multiple targets, and allows the frigates to protect escorted vessels. The system is to be fitted to the Royal Navy’s new Type 26 frigates.